Jason Gilliland, coordinator for the SUNY New Paltz Office of Veteran & Military Services (OVMS), was among the guests of a recent forum discussion of the particular issues faced by women veterans and service members. New York City-based Impact Theatre, a performance collective with a focus on military stories and advocacy, hosted the exercise, which used theatre, dialogue and improvisation to identify themes common to the experiences and perceptions of women who serve in the military. The participants shared their stories and brainstormed ideas for how social institutions might better support women during and after their military service. Gilliland, who in addition to coordinating the College’s military services is also an active service member, said he saw the forum as a valuable opportunity to listen to people whose experiences have been different from his own. “The conversation was open to everybody, so I got an opportunity to listen and also to talk about my own perceptions,” Gilliland said. “Participating in the dialogue gave me new ways of thinking about many issues, and confirmed and reaffirmed some things I knew by intuition but have limited first-hand experience with. 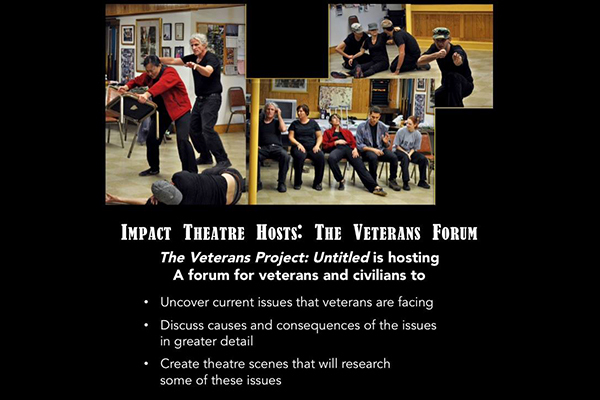 Gilliland’s participation in the Impact Theatre forum builds upon a growing relationship between him and the theatre’s artistic director, Fay Simpson, which began with a March 2015 campus production of “The Veterans Project: Leaving Theatre,” a moving dramatization of common experiences of veterans during their reintegration to society. Like that event, the women’s military forum used storytelling to create opportunities for empathy and generate ideas for supporting veterans. Gilliland credited the event with giving him new ideas to bring back to his work with veterans at New Paltz. “One of the participants in the forum offered an idea I’m very excited about: trying to engage women here at the College through programs dedicated to storytelling, giving people spaces to talk about their experiences in the military and using that as a learning resource for everyone else on campus,” he said. More information about the SUNY New Paltz Office of Veteran & Military Services is available online. To learn more about the College’s inclusion on the 2016 G.I. Jobs list of Military Friendly colleges and universities, please follow this link.